"Featuring Osprey?s Anti-Gravity? suspension system, the women?s-specific Osprey Aura AG? 50 is designed to carry up to 40 pounds without you even noticing the load. It is the perfect companion on weekend or quick overnight trips. 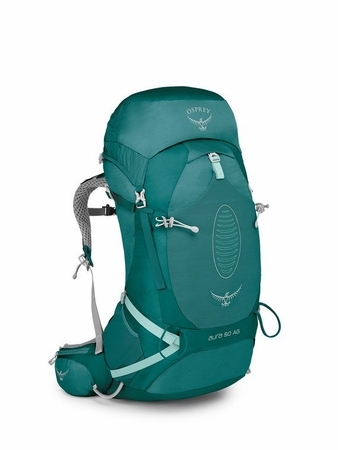 The secret to this award-winning pack is Osprey?s clever Anti-Gravity? suspension system?a seamless backpanel composed of lightweight mesh extending from the top of the backpanel to the hipbelt that contours to the body to deliver outstanding fit and unrestricted movement. The Fit-on-the-Fly? hipbelt and easily adjustable torso length optimizes comfort on the trail. 2868 in3 / 47 l | 28h x 14w x 13d in. | 4.01 lbs. " NOTE: Due to this item's size/ weight, there will be extra fees if you select a faster shipping method than UPS Ground in which we we will contact you before shipping your item(s) with a shipping cost quote.